$189,900 $786 per waterfront foot. 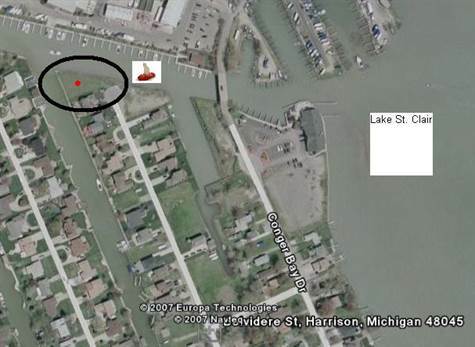 "Prime canal location, 375' of seawall." Style: Lot / Land "Canal community, view of Lake Saint Clair." Size: 19,166 sq. ft. "Square footage of lot." Lot Size: 0.44acres 186ft x 189ft "See survey in downloads. 150x79x186x189"
Year Built: n/a "First day God made the Earth, 3rd day made water!" Practically 375' of lakefront--stone's throw to Belvidere Bay, Lake St. Clair. 189' of seawall on inner canal, 186' of new seawall on N side (E/W run from/to lake). Big lot for big house-2 or 3 story will reveal nice view of lakes/marinas. Located at dead-end of streetnext to 41675 Belvidere. A bargain at $864 per waterfront foot. See virtual tour for interesting aerial view and detailed pics.Taxes are currently non-homestead, will be lower for homestead.